Anger has a lot of energy, but what you use it for is up to you. Sharon Salzberg provides two practices to reflect on anger and transform it into self-compassion. 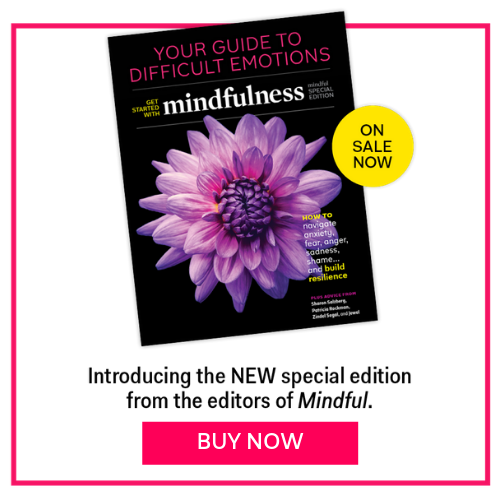 Sharon Salzberg, renowned meditation teacher and bestselling author, recently sat down with Barry Boyce, Mindful’s Editor-in-Chief, for a Facebook Live event at the Mindful office to discuss how to transform anger into love. The following is an adaptation of their conversation. Anger is such a prevalent feeling these days, and so many people are struggling with trying to understand where strength is, and where power lies. And what about the things we’ve been taught to think of as weak or even foolish, like generosity or compassion? We’re hearing more about compassion fatigue. And while many associate anger with power and strength, when we really look at it, compassion requires a whole lot more fortitude. We have an ability to modulate and develop a different relationship to what’s happening to us—that’s actually the transformation that mindfulness makes room for. One of the incredible things about mindfulness, and using the meditative or contemplative process to develop mindfulness, is that we are like our own laboratory. We get to see from within—like, is anger really that strong? What happens when we’re not feeling anger, but consumed by anger? What’s the consequence? What’s the nature? None of this is to say that we should be judging our feelings. We feel what we feel, and this isn’t an invitation to be condemning ourselves or launching some vast self-improvement projects so that we never feel a certain thing again. It’s not that at all, but depending on our relationship to what we are feeling, we may be sucked in there and overcome and overwhelmed, and that’s consequential, because these states, like anger and rage, have certain characteristics. But we actually have flexibility. We have an ability to modulate and develop a different relationship to what’s happening to us—that’s actually the transformation that mindfulness makes room for. Anger has a lot of energy. That’s the positive part. It’s a way of saying no, it’s a way of drawing boundaries, and sometimes it has a lot of courage too. We can depend sometimes, in certain collective workgroups situations, on the angry person in the room—it’s like they’re pointing out the terrible flaw in the carpet and no one else wants to look at it. Everyone is studiously looking somewhere else, trying to pretend it’s not there, and they’re saying, “No, look at that.” And that’s a useful thing for all of us, for all of society. Anger has a lot of energy. That’s the positive part. And yet, if we are lost in anger, if we’re overcome by anger, if that’s really what’s guiding us, it can have terrible consequences for us and for our actions. Our first exercise is a thought experiment. Bring up a time in your mind when you were really angry at yourself. Just bring it back and let it fill you. Notice what that feels like in your body. Notice what that story is. It’s like you’re watching the anger movie, and it’s interesting. Anger can feel like a kind of compression, like tunnel vision. Maybe you did five great things that same day, but those five great things have been lost and only the angry moment remains. That’s how we become lost in the conviction that: “I’m a stupid idiot. That’s all I’ll ever be.” We’ve erased all the evidence that says we’re more than just our anger. That’s part of the destructive nature of anger. Our task in a way is certainly not to belittle ourselves for what we’re feeling, but to somehow capture that energy in a way that is courageous, in a way that gives us permission to say “no,” that helps us set boundaries, without getting lost in anger’s tunnel vision. That’s actually the definition of mindfulness: It’s a relationship to our experience, so we are not consumed by what’s happening. And we’re also not projecting it. And that means, first of all, having a certain space from the anger. We see it, we connect to it, and yet we’re not necessarily drowning in it. At the same time, we’re not pushing it away. A very common foundation practice involves resting your attention on the feeling of the breath. Just the normal, natural breath, wherever you find it most powerful—this is where we hone our relationship with our present experience, so we can connect to it as it is, without judgment. Sit comfortably. You can close your eyes, or keep them open. Notice your breathing. See if you can find the place where your breath is strongest for you, the clearest for you, e.g. where do you feel the rise and fall of your breathing most strongly? Maybe the nostrils, or the chest, or the abdomen. Direct your attention towards one place. Bring your attention to that place and just rest your attention lightly. Focus on one breath at a time. Just feel the sensations of the natural breath, one breath at a time. Note when the inner voice surfaces. If your attention starts to wander, and you realize that, notice how you speak to yourself. Is it harsh? Is it punitive? Gently return to the breath. If so, see if you can gentle that voice, and bring your attention back to the feeling of the breath. Why Is It So Hard to Be Vulnerable?